Greetings, years ago I was active here during construction of my Viper powered 72 240z. 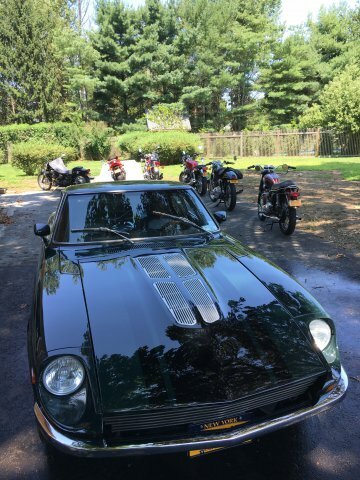 Car has been on the road for almost 10 years and I am now retired and have moved from LA to rural eastern Long Island where there are very few sophisticated automotive service shops. Since I have time and no local expertise to help me, I am in DIY mode. I am undertaking some maintenance tasks (ball joints, tie rod ends) and refinement on the Z. It runs very well but has very noticeable driveline noise. To provide some background, the drivetrain consists of: Gen II Viper crate motor (stock except dyno tune), Viper headers with collectors rotated 90 degrees, Viper hydraulicly actuated clutch, T56 Tranzilla (from Rockland Standard Gear), aluminum driveshaft (approx 18” long due to engine setback, balanced, w heavy duty U joints), R200 long nose differential with Quaife LSD, Modern Motorsports CV joints/half shafts. The transmission rear mount is rubber while the R200 is mounted with Arizona Zcar Moustache bar and a solid lower mount. The transmission is pretty noisy and shifts are notchy until it warms up. It has only about 1000 miles on it and the correct lubricant, just its nature I believe. The differential is also noisy. This week I drained the lubricant and found significant debris on the magnetic drain plug. I am now in the process of removing the differential. My immediate problem is I do not understand how the outer CV joints are retained to the wheel carriers. I have removed the 6 small bolts on the circumference of the outer joints but the joint does not disengage from the carrier. I dropped the lower control arms (Arizona Zcar tubular steel, before billet) and was able to swing the struts outwards enough to disengage the axles from the differential. However, I have been unable to remove the axles from the car. I have done some banging on the outer joints with no success and am reluctant to apply more force and risk damage until I understand how they are retained to the carrier. Modern Motorsports is no longer in business so no help is available there. 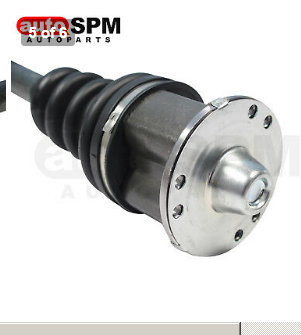 I can remove the differential without removing the half shafts from the car if I have to but would prefer to remove the shafts to clean and paint. The next problem will be where to get the R200 rebuilt so any recommendations for a shop to do that would be very welcome, the further east towards NY the better. Not sure how badly damaged it is but I had a shop in LA go through it before I moved. 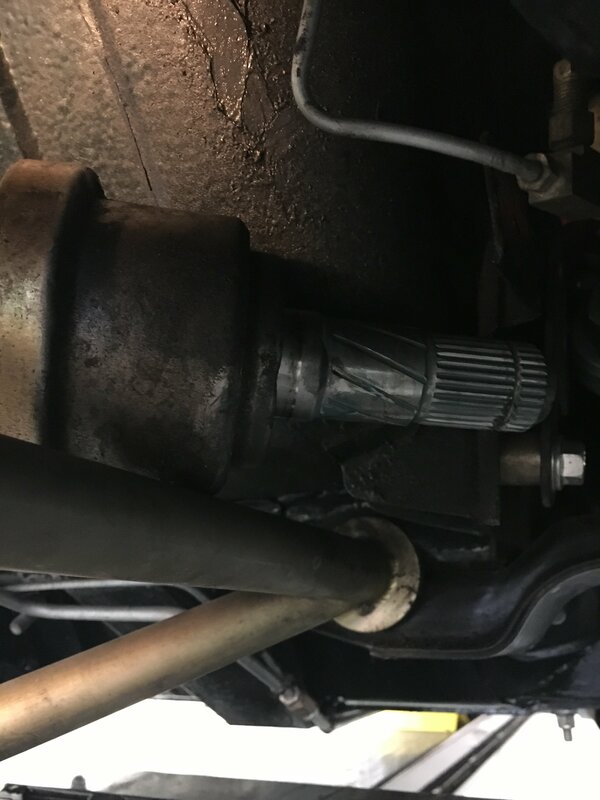 They found the pinion angle to be excessive, welded up the Moustache bar and redrilled the differential mounting holes to achieve the correct angle. In addition they replaced the ring and pinion with good used parts (apparently new gear sets are not available), cleaned and installed new bearings and reset lash. I thought It was noisy when I got it back then and now I know something wasn’t right. Unsure if the damage is just due to torque loads or incorrect setup. I have 275/35 R18 rear tires which provide moderate traction and I don’t drive the car hard or dump the clutch. I am also thinking I need to do something about the solid lower mount under the nose of the differential to reduce noise. 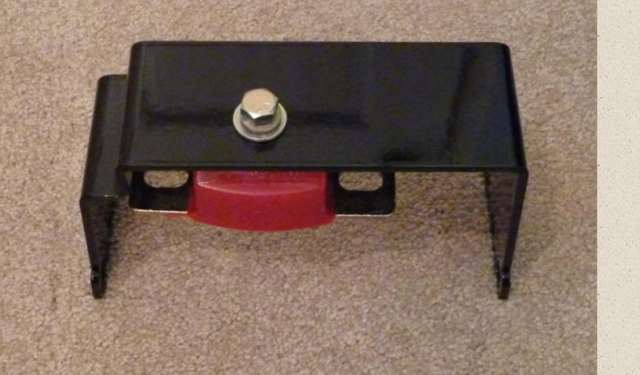 I have ordered a top mount bracket with a urethane insulator but not sure I can make it fit in my car as there is a hydraulic brake “line lock” unit situated in that area acting as my emergency brake. Will see if it can be made to fit when it arrives. I don’t want to change the emergency brake setup as it has worked well. Well, that’s it for now. When everything is back together and running well, I plan to make a video of the car, it sounds, at least to my ear, great, especially at higher revs. I would very much appreciate any feedback or recommendations the community can provide. Perhaps photos of your setup would help. 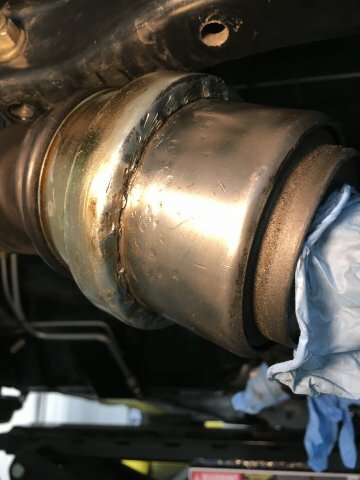 A stock R200 in a 280z have 4 bolt , U Joints setup. These simply unbolt and pull out. The actually shafts which go into the diff are simply held in with a C clip. A couple big screw drivers on either side prying evenely will over power the c clip and it will pop out. My immediate problem is I do not understand how the outer CV joints are retained to the wheel carriers. I have removed the 6 small bolts on the circumference of the outer joints but the joint does not disengage from the carrier. I dropped the lower control arms (Arizona Zcar tubular steel, before billet) and was able to swing the struts outwards enough to disengage the axles from the differential. However, I have been unable to remove the axles from the car. I have done some banging on the outer joints with no success and am reluctant to apply more force and risk damage until I understand how they are retained to the carrier. Sounds like you have a 280ZX CV shaft. They still just pop out from the carrier, like the shorter 280Z shafts. There is a circlip inside that fits matching grooves. I have used an oiled chisel to drive between the housing and the shaft to lever it out. Apparently, though, some of the aftermarket diffs have a tighter fit and the circlip can be difficult to get out of its groove. Here's a diagram from the 280ZX FSM, showing the complementary grooves and the circlip inside. The clip should stay inside the diff. The end of the shafts I'm having difficulty removing is the outboard end nearest the wheel. The inboard ends slid right out. I will post a picture. The CV joints and shafts were part of a kit I bought years ago from Modern Motorsports. I think the shafts were custom made but not positive. The second picture is the inboard end. of the shaft which plugs into the diff. The last is a shot of the car before I tore it apart. Is rebuilding an R200 the sort of thing a novice can do successfully? Probably better ship it somewhere that knows them well. Suggestions welcome. Sorry, when you said "carrier" I thought that you meant the diff. The outboard side is usually called the hub. Anyway, there's no locating ring or anything to stick on that end of the axle. That thin piece of brass-colored metal is just the grease containment seal for the CV joint. I'll bet it's just stuck on some new paint on the hub. It's just two big flat surfaces pressed against each other. Here's what the end looks like. A rubber hammer will probably knock it loose or some careful prying. It's not a sealing surface. Edit - make sure that the CV housing doesn't come off of the sealing plate though. You'll get grease everywhere. You can see the little tabs that hold it on. The inboard ends slid right out. This might be the cause of the noise and/or damage. These should be solidly locked in to place by the circlip. You should have needed to pry them out. The inverse of the problem I mentioned above, difficulty removing the axles from aftermarket diffs, is that they can also be difficult to insert. Some people just leave the clips out, or destroy them by pounding the axles in. You'll know when it gets taken apart. Might actually be cheaper to just buy a new one. Thank you NewZed, your picture shows clearly the only thing retaining the outboard joints to the hubs are the 6 bolts. Mine must be stuck together by some corrosion or paint as you suggest. The other issue you raise is more troubling, that the axles should not have just slid out of the differential! The circlips seem to be missing. I assume the circlip is intended to locate the axle laterally within the differential, without the clips the axle will move back and forth somewhat as the suspension goes through its travel. Perhaps this was causing the metal debris I found on the drain plug. Probably not the whine which is more of a continuous noise at constant throttle. I assume the circlips must be installed after after the axles are inserted into the differential on the bench and then the rear cover installed? Is there a procedure somewhere describing the process? Then the differential with axles inserted and retained by circlips is installed in the chassis? Cheaper to buy a new what? I assume you mean new circlips? Still hoping for recommendations on potential shops to inspect/repair the R200. There was a time when the Quaife diffs didn't come with the circlips pre installed and you (or your installer) had to install them before installing the diff into the case. I've read people's troubles installing them after the diff is in the case. The circlips needs to be compressed and pushed square into the driveshaft hole until it expands into its groove. Sounds like yours just wasn't ever installed. Thanks jonbill. I will look for information on the Quaife axle/circlip installation procedure. Another thing to consider....solid diff mounts will transmit WAY more noise to the shell than non-solid mounts. 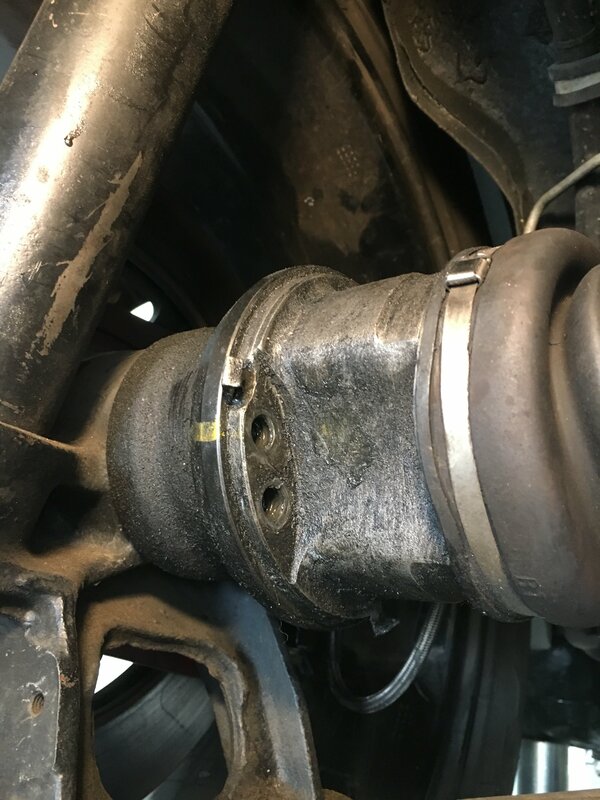 Before deciding that your diff needs internal work, may want to determine if it's just the solid mounts that are causing the noisy running condition. If you decide that you do want to tear into the R200, there's nothing magic about it....but you will need a dial indicator to measure backlash. jhm makes a good point about solid diff mounts and noise. The early R200's had loose tolerances on the gears and they tend to howl or whine or warble. Nissan put a lot of effort in to isolating the diff from the body with rubber bushings. The clips are installed in the diff before the axles are inserted. They spring open as the axle slides through then close up in the axle's groove. ok, still no luck freeing the outboard cv joints from the hubs. Tried the chisel approach but no go. I have ordered the Nissan clips identified in the thread that was sent. But one mystery has been resolved, on the driver's side of the car the inner cv joint has been throwing grease up on the floorpan. I had carefully inspected the boot many times and could find no damage and no evidence of grease escaping but when wiping down the joint I saw what I could not see with the differential in the car. 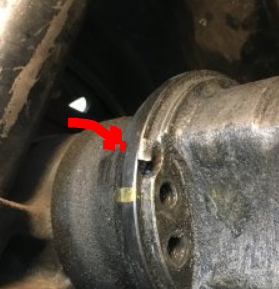 See attached picture, looks like someone had the two halves of the joint apart at some point and beat the flange over to reseal it. Grease has been escaping from this area. Is this fixable with some silicone sealant or do I need to replace the joint, if thats even possible? Or purchase a new axle with joints installed? And does that have to be done as a pair so two new axles? Are these available? Where might I source them? Are these available? Where might I source them? That is weird. You could release the three bent over clips (picture below) and pull the axles, leaving the sealing plate behind. Maybe you'll find something odd. Maybe they fastened the sealing plate on then assembled the CV afterward. People do strange things, like they did on your inboard CV. I posted a link to where my earlier picture came from that showed a source for the axles. They were used on 2+2 280ZX's or turbo 280ZX's. They're hard to find and sometimes the aftermarket parts are different. If you find one at a parts store take your old one to compare lengths. Thanks NewZed. I am giving up trying to remove the axles for now, I have cleaned them, applied silicone sealant along the perimeter of that joint on both CV’s and will disassemble the boots so I can replace the grease that was lost. I am taking the R200 to a local shop tomorrow and see what they say about its condition and rebuild cost. The axle clips should arrive well before the R200 is repaired. Based on JHM’s and your earlier comments about solid mounts, I purchased the T3 upper mount/bracket. It arrived and is a nicely made piece. I spent a good part of yesterday installing it. This was made somewhat challenging because the area above the R200 nose is occupied by my emergency brake solution which is a “line lock” type device with a pressure switch and a solenoid in lieu of a mechanical emergency brake. To apply the brake, I turn on the power and plush firmly on the brake pedal. To release, I turn off the power and again press the pedal firmly. Works pretty well and I didn’t want to invent a new emergency brake solution. I was able to loosen the brake lines and rotate the pieces from vertical to horizontal and attach it to the floor pan with an existing fastener which was probably for the interior console. Had to trim a small piece from a bracket, when I finish I will post a picture. In any case, it appears it will all fit in the 2” above the bracket below the floor but its tight. Will have to trim the urethane bumper when the R200 is back. Thanks for everyone’s input. Hopefully with the R200 in good health, axles clipped in, and getting rid of the solid mount, the car will drive like a small limo. It mounts above. The T3 version is very intricate but seems like lots of design for the same function. Looks like a work of art though. Based on JHM’s and your earlier comments about solid mounts, I purchased the T3 upper mount/bracket﻿. It arrived and is a nicely made piece. I spent a good part of yesterday installing it. This was made somewhat challenging because the area above the R200 nose is occupied by my emergency brake solution which is a “line lock” type device with a pressure switch and a solenoid in lieu of a mechanical emergency brake. Actually, not sure which T3 part you got. Their web site is too fancy to work through. Hey NewZed, thx for that link to TechnoVersions. I had no idea that someone was still producing an RT-style diff mount. Good info! I have the second one, from Technoversions that goes over the top. Didn’t know theat T3 offered a lower mount as well. I wonder if I could use them both for additional strength and to keep differential movement to a minimum while softmounted. Wouldn’t need the cables in that scenario. Many folks will run just the upper Ron Tyler-style mount by itself....it's surprisingly secure. Others, especially folks putting down crazy power and executing repeated hard dragstrip launches, prefer to tie the two side lower frame structures together with the additional security of the lower diff mount (some guys have actually ripped out their forward rear LCA mounts when not using something like the lower differential mount to tie the two sides together). I would like to use some sort of rubber or urethane in the lower mount in addition to the RT mount on top. I have been using the Arizonzcar billet lower mount. Is there an OEM or aftermarket alternative to the solid lower mount that works with the OEM lower mount? I don’t drive the car hard but for noise and strength reasons i would prefer to have both upper and lower support for the differential. The default RT mount setup from technoversions (polyurethane snubber up top) works well with an OEM mount on the bottom, and, in my opinion, provides the best of both worlds for performance/noise. The pressure on the upper poly mount is low when just cruising, but it's there to keep the nose of the diff from lifting under acceleration. When under no load/engine braking, the diff pushes down on the OEM mount and doesn't transfer any additional vibration through the poly mount up top. I believe I've also seen a setup using the RT mount where the energy suspension mount was bolted to the top of the diff with the OEM mount bolted to the bottom, and both installed, but I think that's a bit excessive myself. I have my own RT style mount with the urethane GM mount, hanging the diff nose from above. No bottom mount at all, just the crossmember with no mount on it. It's quiet. I had urethane mustache bar mounts though and had to do some spacing with washers to keep the urethane from transmitting diff noise to the cabin. So take care to isolate the mustache bar mounts also if you want to make it quiet. The key to keeping it quiet is to allow just a small amount of play in the bushings. Don't clamp the urethane down tightly. With a stock rubber mount on the bottom you could leave a small air gap between the snubber and the diff to avoid noise transmission. You'd want a new rubber Nissan mount though to avoid thumping/clunking. The thump comes from the diff nose dropping down after lifting during acceleration. The T3 mount is kind of overkill with the wires because the Energy Suspension mount has interlocking metal inside to hold it together if the urethane fails. Thats why it works well alone on the top, it's not just hanging from urethane, there's metal in there. The metal is separated by urethane though so it doesn't transmit noise. I ordered a stock Nissan mount for the lower crossmember. I have the ArizonaZcar Moustache bar and black mounts that came with it, not sure if they are rubber or urethane. Cant visualize what you are suggesting for isolating the Moustache bar mounts with spacers. Can you provide some further details? Just imagine that each bushing has a little bit of room to move. Just a hair. The tighter the metal is pressed in to the urethane the more vibration that will be transmitted. I used washers to add length to the center tube for my urethane bushings so that the urethane is not clamped tightly. AZC's bar might not need anything. I just remembered something that you might want to consider that might also be part of your noise problem. Driveline angles. Ron Tyler designed his first mount for a small block chevy application, so the diff nose is angled up a little bit if you use the hanging GM mount. With a snubber and the Nissan lower mount you maintain the original Nissan diff nose angle. But your V10 application might need some adjustment. Worth confirming and adjusting while you're working on it. NewZed, regarding your pinion angle observation, I am sensitive to this issue. Before I moved from LA, I had my race shop do some work on the car, installed electric power steering, R200 ring/pinion swap, etc. They found the drive shaft vs pinion angle difference to be 3.7 degrees. They welded up the Moustache bar differential mounting holes and redrilled them ending up at 0.3 degrees difference. I will be careful not to change the installed height of the differential nose when I replace the solid AZC lower mount with the OEM Nissan. In any case, I will measure the angle difference after installation to confirm.